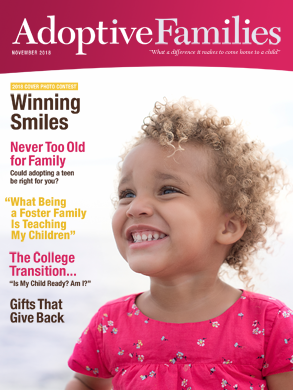 Readers share feedback about articles published in the Nov/Dec 2018 issue of Adoptive Families magazine. We adopted a 13-year-old. She is 17 now, with an incredibly bright future! These kids deserve a great start to adulthood provided by a loving family. One of the boys who comes to our after-school program has been in foster care and his foster family officially adopted him this week, a few days before he turned 18. Brought tears to my eyes when I heard about it. Infertility brought me to adoption. It hurts less now that I am a mom, but it is a painful part of me and will always hurt, no matter how happy I am that I went through the pain to get to where I am now—a lot closer with my husband and a mom to two amazing kids! As a husband I can identify with much of this article, especially wanting my wife to experience pregnancy and all it brings. We’re still grieving even though we’re in the waiting phase of adoption. Ask AF: Advice for Our "Ice Breaker" Meeting with a 10-Year-Old Boy? ON THE COVER: Everett and Aveline (3 years and 7 months, U.S.), children of Nik and Hollie, Oklahoma. Photograph by Katie Lawrence Photography. "My son and I were bonding again... it was as if seeds that were sowed and nurtured over the years began to bloom."